A graphite cavity ionization chamber made by the Osterreichisches Forschunggszentrum Seiberdorf, has been installed as a primary standard for 60Co radiation at the Laboratorio Nacional de Metrologia das Radiacoes lonizantes, (LNMRI). 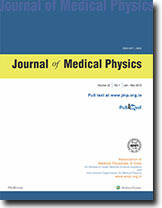 This paper describes several aspects of the experimental arrangement: the radiation source and all modifications made in the beam collimating system in order to improve its flatness; the additional shutter built to avoid output changes due to the cobalt pellets movement inside the capsule; the special insulated room constructed inside of one of the existing facilities to minimize the temperature gradient inside the room and the chamber positioning system using a position transducer. In addition, description of the automated data acquisition system, the mathematical formalism for the calculation of the quantities of interest and the statistical treatment are given. The results of an intercomparison made with the BlPM has shown an agreement better than 0.1%. Furthermore, comparisons made with several secondary standards under the same experimental conditions have also shown an excellent agreement. For superficial lesions of the skin/soft tissue with depths less than 2 cm, it is conventional to select superficial x-rays for treatment since it provides a cost effective treatment compared to a low-energy electron beam. For certain lesion sites, the proximity of a bone may result in dose homogeneity. We have investigated the dosimetric differences between a 100 kV, 3.0 mm Al HVLand a 6 MeV electron beam of 5 cm size. A bone thickness of 1 cm with 0.5 cm tissue in the forehead region was considered. Using the ITS Monte Carlo code, the photon and electron central axis depth doses were first simulated and matched to the available machine data and then used to predict dose distribution for the case. Our results demonstrate that the dose to the bone may exceed 300% in the case of the superficial x-ray beam as opposed to a 2% decrease in the case of the electron beam. An analysis of three types of detectors used for dose calculation and verification during total body irradiation (TBI), procedure is presented. Doses were traced in ten points representative for body anatomy on beam entry and exit. To verify the calculated doses, a set of semiconductor, thermoluminescent and ionization detectors has been applied. Application of each type of detector has been discussed and their response to dose in TBI condition evaluated. The accuracy of dose determination between 2.6% to 3.3% on entry and 5.8% to 7.7% on exit was achieved depending on the type of detector. In some treatment protocols different parts of a target volume need to be irradiated with different doses. This can be achieved with a four-beam irradiation technique and dose rate modifying absorbers. The calculation of the transmission and thickness of the absorbers are based on the unmodified doses from single beam at a calculation point. Corrections are done by a modified graphic beam-zone method to consider the influence of the absorbers on scattered radiation. Phantom measurements show good agreement with the calculated values. The modification method is applicable without 3D planning systems but requires a small number of beams to limit the calculation and manufacture efforts. The three dimensional dose distributions of Manchester system planar implants were compared to Paris system planar implants using the dose nonuniformity ratio. Single-plane implants and double-plane implants with equal as well as unequal implant planar areas were configured according to the implantation rules of Manchester and Paris systems. The three dimensional dose distributions were analyzed using cumulative dose volume curves and the dose nonuniformity ratio. The dose nonuniformity ratio was calculated as the quotient of the high dose volume (defined as the volume receiving dose rates greater than 1.5 times the reference dose rate) divided by the reference dose volume (defined as the volume receiving dose rates greater than or equal to the reference dose rate). The dose uniformity of the double-plane implants from both dosimetry systems were found to be comparable. Using the examples presented, we cannot continue to advocate the generalization that a dosimetry system that uses nonuniform sources produces a uniform dose distribution while a dosimetry system that uses uniform sources produces a nonuniform dose distribution. Twelve patients with stage IIB carcinoma of the cervix were treated with intracavitary therapy using the Nucletron Ring applicators according to the following protocol: External beam therapy using antero-posterior . Portals at 190 cGy per fraction for 24 fractions, 4 fractions per week and intracavitary therapy of 490 cGy weekly to point A on the 5th day of treatment for 5 weeks. Dosimetry was performed to analyze the dose to the bladder with the bladder full and empty. When the bladder was empty, the radiation dose to its anterior surface ranged from 106-1 26 cGy with a mean of 11 4.5 cGy, and that reaching the posterior surface ranged from 242-340 cGy with a mean of 297.1 cGy. When the bladder was full, the dose to the anterior surface of the full bladder in the pelvis ranged from 104-140 cGy with a mean of 122.08 cGy and the dose to the posterior surface ranged from 4940-8740 cGy with a mean of 661 9 cGy. Thus, approximately 35 an length of the posterior wall of the bladder receives a significantly higher dose if the bladder is treated full (p - 0.0000). Until better ways of shielding the bladder are developed it may be better to treat with the bladder completely empty during intracavitary therapy for carcinoma of the cervix. Single planar 'interstitial implants aim to irradiate 10 mm thickness of tissue to uniform dose. Interstitial iridium implants are normally practised with the same linear activity throughout the implant. As a result, the peripheral regions of the implant get lesser dose contribution from the central wires. Out study with the Planning System for a 5 x 4 cm2 area of parallel implant geometry shows that the peripheral regions receive only 83% of the prescribed dose and the minimum treated thickness is 7.6 mm only. increasing either the activity or time weight to the peripheral wires by 25% enables the peripheral regions to receive a minimum of 92% of the prescribed dose and the minimum treated thickness increases to 8.80 mm. The removal time of peripheral wires with time weight option can be calculated manually by a simple formula. The use of modified linear quadratic model in radiotherapeutic practice is extended for fractionated treatment regimes using the formula Em = N[a1d + a2d2 (TI N) -k]. This equation requires data on two important parameters viz. a1 / a2 & k, the values of which vary from tissue to tissue. To estimate a1 / a2, two methods are applied to radiation isoeffect data for spleen and kidney. The parameter k has been estimated from repair half life and cell doubling time of the tissue.